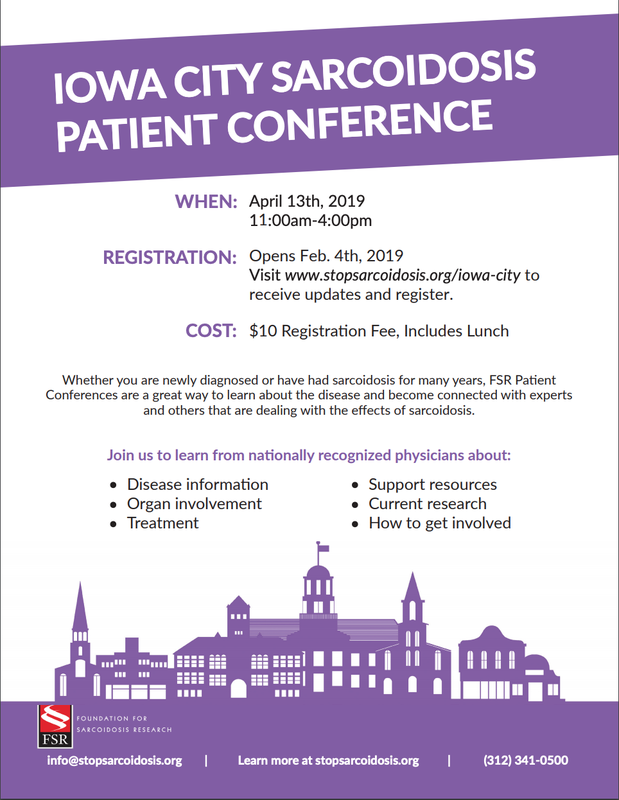 Please join the Foundation for Sarcoidosis Research and internationally recognized physicians in Iowa City to gain valuable insight into sarcoidosis. Patients and loved ones will have the opportunity to learn about FSR’s research initiatives, sarcoidosis treatment options, and clinical care with experts in the field in Iowa City. April 13th is World Sarcoidosis Day! Did you know that April 13th is World Sarcoidosis Day? Show your support by wearing purple to the Iowa City Patient Conference. Attendees will have the option to join us for a group photo at the end of event which FSR will share on social media!If you don't have a purple sarcoidosis shirt, choose to add a t-shirt to your conference registration below. Any shirt orders placed here by Wednesday, April 10th will be given to you at the registration table at the conference.